AutonomeForme | Marco Scarpinato and Lucia Pierro were invited to the 53rd World Congress “IFLA 2016″ | “Tasting the Landscape” to present their work “Resilient Landscapes”: strategies and LandscapeDesign projects developed for the regeneration of the Disused Industrial Areas and of the Zones Temporarily Abandoned located in Turin, Venice, Rome, Naples, SalineJoniche, Messina, Catania and Palermo. Tasting the Landscape, the title chosen for the 53rd International IFLA (International Federation of Landscape Architects) Congress, calls for the interpretation of the landscape project as an expression of a greater consciousness of the transformation processes and as an opportunity to improve the places where populations carry out their life. 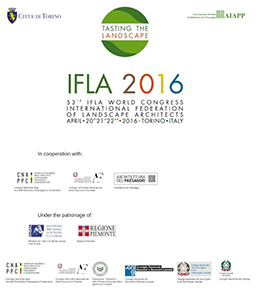 AutonomeForme will hold the extended speech “Resilient Landscapes” on April 22 at the Centro Congressi Lingotto in Torino.